Please use this format for ANY email you send to me. If it is not connected with any homework, at least write your class name (WS or SinE) in the subject line and your family name. And always use the proper greeting and closing. Click the image to see a bigger version. Hello. I’m Konishi in your Academic skills class. I forgot my presentation theme of book. Would you be able to tell me it? Hello. I’m Ueda in your academic skills class. 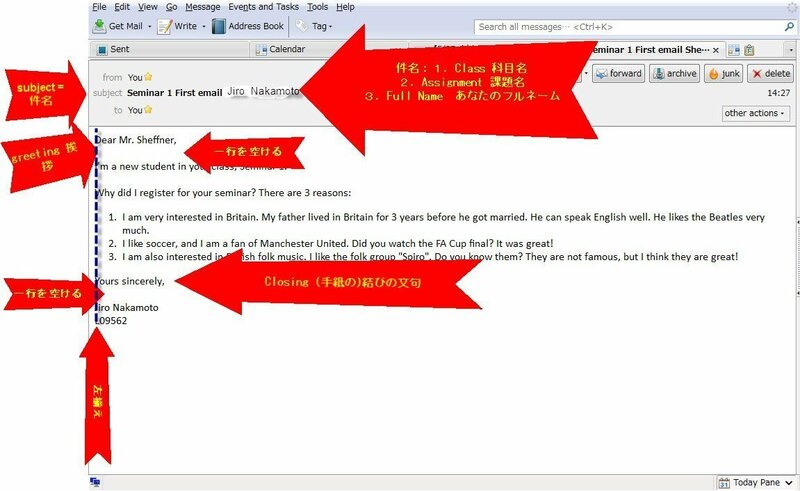 I didn’t talk about my presentation last class, but I didn’t get e-mail from you Sunday evening. Hi. I’m Misa in your Academic class. I’m wondering if we gonna have the class or not.